I was attending a talk in History given by guest speaker Simeon Man. The title of the talk: “Aloha, Vietnam,” conveyed a bizarre paradox in the history of Asian Americans, who played a significant role in the granting of statehood to Hawai’i in 1959, but who also contributed to developing the military industrial complex there after World War II. Some of these Asian Americans, who either volunteered or were forcibly recruited (like the Japanese Nissei) to fight in the Pacific War, returned to Hawai’i after the war and became prominent civic and political leaders. But a part of their development of Hawai’i’s economy involved a tourist industry geared specifically for military servicemen working on one of the many bases on Oah’u; and the appropriation of hinterland for military training. In fact, the 42nd Infantry Brigade, which was conscripted to serve in WWII but also in the Korean and Vietnam wars, specialized in training for tropical climates and guerrilla warfare. They would build these mock villages, get Asian American soldiers to play the role of “the enemy” in the villages, and stage these mock battles and skirmishes. While Man’s larger point was interesting enough (how Asian American narratives of citizenship and earning our rights can’t be separated from our collective indirect and direct participation in US colonial and imperial wars in Asia from the Philippines to Korea, Vietnam, Laos, and Cambodia), I was drawn to a particular example of “racial liberalism” in wartime that he mentioned: how the US recruited and employed Filipino doctors and nurses from the Philippines to service the US military hospitals in Vietnam, and to tend specifically to injured Vietnamese civilians. 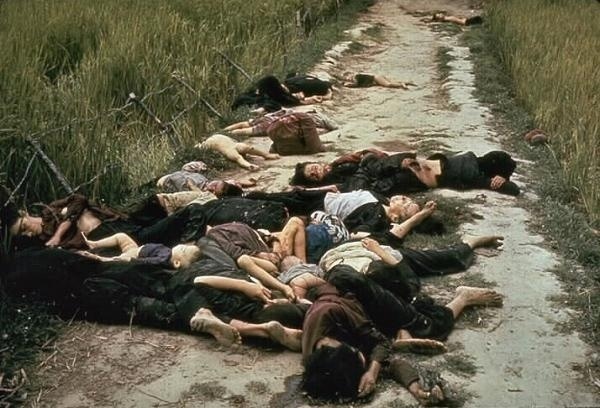 The idea was that winning the “hearts and minds” of Vietnamese would involve finding ways to preempt the Vietnamese from seeing the US presence as a foreign one; and (therefore) regarding the Vietnam war as a racial one instead of an ideological, Cold War. The My-Lai massacre put an end to that charade; just like Abu Ghraib put an end to the farce of the Iraq war as a war of liberation. Despite US attempts to distance themselves from the colonial war formerly waged by the French, we could not disavow our complicity and desired participation in the imperial legacy. Exhibit 2: when Filipino veterans and US citizens who assisted the Americans during World War II were deprived of the same benefits as all other veterans, they had to resort to the same appeals to their patriotism and sacrifice, and continue performing their unconditional loyalty to the US decade after decade, knowing full well that their congressmen and senators considered them aliens and foreigners just trying to seize a privilege to which they were not “entitled.” It’s like being caught in this vicious, masochistic cycle, where the indefinite suspension of your rights only further compels the demand for unconditional sacrifice and loyalty. Exhibit 3: Filipinos feel indebted to the American colonial system for forcing us to learn English. Today, one of the reasons for Filipino employment in the international service sector is our competence in English. But if US education was such a boon, why do the majority of Filipinos only get jobs in the service sector? Why are apologists for US education so certain that Filipinos wouldn’t have learned English, or any other language for that matter, if not for the (mis)fortune of colonial conquest and imperial rule? I mean, did Rizal really need a Spanish colonizer to learn Sanskrit, Russian, German, French, and English? One could even go further: is it possible that the cultivation of indigenous languages at the expense of an imperial language might have fostered a greater investment in regional economies and local governance, instead of full-on absolute surrender to the international division of commodity specialization, World Band and IMF stipulations, and the impunity of oligarchs and their private armies? In the luminous words of Cuban martyr José Martí’s famous speech “Nuestra América,” the author declares: “We make wine with bananas; but even if it is bitter, it is still our wine!” There is much to be learned in that essay, which inspired generations of leaders and statesmen. This brings me to the final point: I always thought of Filipino employment in the US health services industry as something of a sacred cow, untainted by either US imperial designs or colonial mentality. I always just assumed that Filipinos were just naturally good doctors and nurses; that the US just happened to have a shortage of these positions during the expansion of the medical industrial complex in the 1960s; and, voila, the 1965 Immigration law allowed Filipinos and other Asians to come to the US and begin their lives on steadier footing than the agricultural laborers, GI War brides, and Filipino servicemen that had preceded them. My parents were part of that generation: they came in 1965, spoke English fluently before ever stepping foot in the US, eventually bought a house in the suburbs, everything. It never occurred to me that even the incentive to cultivate Filipinos into a professional class for export was tied to a larger narrative. But then, that’s the American in me. After all, how many countries offer their citizens the bonafide right to remain ignorant about the world and its people, as well as each other and ourselves, our histories and itineraries across centuries and hemispheres? Aude sapere, as the old crank from Königsberg would say. is a denizen of San Diego, a border city that has never mustered the courage to embrace its uniqueness as such. It gathers in the world's diasporas with all their idiosyncratic ways of reinventing the idea of an imperial melting pot, and scatters them across this Great Pacific stretch. I work at the local university, researching the cartographies of non-Western modernity between the sixteenth and twentieth centuries, and I teach literature and culture courses on the wild side of enlightenment: from the conquest of the Americas and the Philippines to the cultures of Orientalism and the baroque in modern literature. I love music, laughter, and philosophy (in that order), I do yoga, my wife is a novelist, and my daughter just blew almost a year's worth of allowance on an American Girl doll. Very interesting and informative read. I was intrigued by the details about Filipino doctors being recruited by the US army to attend to vietnamese patients and your conclusion that the war in Vietnam being a racial one on top of it being an ideological one. It’s interesting to note that vietnamese also had a racial narrative about the US being the “green eyed demon”. It would be fun to see if i can look for any culture production during the Vietnam War to collect more on this discourse. I believe we have briefly meet in professor Espiritu’s house, my name is Ly Nguyen, from ethnic studies department. That’s an interesting question…I don’t know if it’s related, but a few years ago I taught this novel by Bao Ninh called The Sorrow of War, and the main character is haunted by ghosts of the dead. It’s a brutal and terribly sad novel, but my students really liked it. At the time it was written, it was virtually the only version of the Vietnam war that was written by someone from the North Vietnamese side. I think this writer went on to become well known, but it was a number of years before anyone had heard of the novel. Política común 5 (special issue: Carl Schmitt and the Early Modern World, edited by Jody Blanco and Ivonne del Valle) is out today!